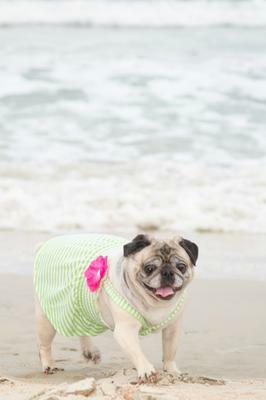 Our now 10 yr old Pug Sadie Layne loves Flagler Beach, Florida. She can run about and play on the whole beach. Last August was her second time visiting Flagler Beach, Fl. 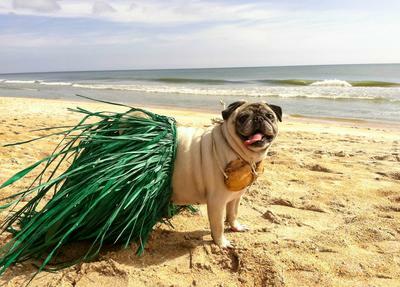 and she can't wait to go back next year.The whole town at Flagler beach was so welcoming of our beloved fur baby Sadie Pug and was kind enough to let her come into their shops and some beach side restaurants, especially High Tides Snack Shack. It was very pet friendly and they even brought Sadie Pug a complimentary bowl of fresh cold water and a doggie biscuit. 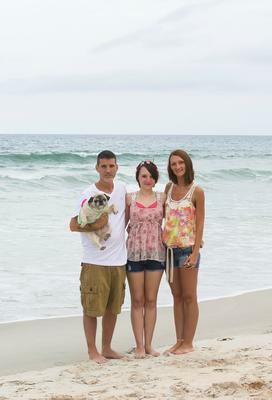 We will plan to eat there every time we visit Flagler Beach on our family vacations. Hey guys! Sadie pug will be coming back to Flagler Beach again this summer sometime in July so be on the lookout for another cute photo session of her and her sister Brownie the Corgi/Shepard mix. 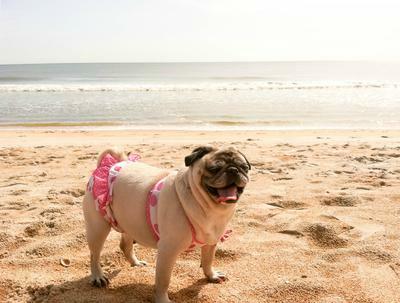 We came to Flagler in summer of 2015 but it was just so hot out on miss Sadie pug and her now being a Senior pug the heat is getting too much for her so she stayed and relaxed in the hotel room but could see her mommy, daddy and human sister on the beach from where she lay on the bed looking out the balcony doors. I hope this time we can get a fun shoot of her and her sister on the beach so I’ll have some more new cute pics to share on here for all you beach going mommies, daddies and fur babies to see so you too can come enjoy Flagler beach that is totally pet friendly! So glad to hear that Sadie Layne was welcome at Flagler Beach. Flagler is beautiful and welcoming to pets and people. Hope your beautiful Sadie will return often and of course, bring the whole family. Our labs love the beaches, too. Thanks for your comments!